The Urban Decay 24/7 Glide-On Eye Pencil comes in standard colors like black and brown, as well as eye-catching hues such as light blue, purple, and green. If you’re like me, you don’t want runny eyeliner that makes you look like a raccoon by the end of a night out. The Urban Decay 24/7 Glide-On Eye Pencil truly lives up to its name, by providing smudge-proof and creamy eyeliner in both fun and practical colors that lasts day and night, all at a reasonable price. Eyeliners are a part of my daily makeup routine, and Urban Decay’s eye pencils are an affordable alternative to more high-end brands, while offering the same level of quality. Urban Decay has long been known for its edgy makeup palettee and trendy yet practical products—the 24/7 Glide-On Pencil is no exception. The pencil is meant to provide “powerful, vibrant color that slides on smooth” and is certainly the creamiest eye pencil that I have ever used. Once the liner sets—more on that later—the color will not smudge and will literally last for twenty-four hours or more. If you’re like me and sometimes forget to wash your face before bed, the liner will still be intact and pristine when you wake up, which is great if you are running late the next morning! Of course, if you do want to wash it off, simple soap and warm water or eye makeup remover will easily do the trick. This eye pencil is great for girls on the go or novice makeup users, since it is easy to apply, easy to take off, and waterproof and smudge-resistant. The Urban Decay 24/7 Glide-On Eye Pencil also packs some cool extras. If you are a more advanced makeup user, the creamy formula takes about thirty seconds to “dry,” allowing you to smudge it and create smoky eye looks or a more uneven line. This does not mean that the liner is liquid liner—it is simply very creamy. If you do not want to smudge it, then after about thirty seconds the liner will set into place and be smudge-proof. I have actually used these pencils as alternatives to eye shadows when I was in a pinch or didn’t have the right eye shadow colors available. 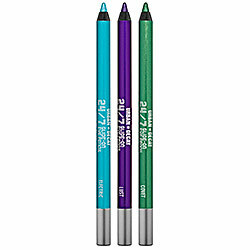 The 24/7 Glide-On Eye Pencil also comes in an awesome array of colors. You have the usual black, brown, and other neutrals, but you also have vibrant blues, greens, and purples that you might not be able to find at other high-end counters. Urban Decay does a great job of satisfying both ends of the consumer spectrum—those looking for a sensible, smudge-proof liner, and those looking for hip and trendy colors to create artistic makeup looks. Stays on for 24/7—or longer! Of course, the 24/7 Glide-On Pencil is not perfect for everyone. For starters, it does not come with a sharpener, like many other (albeit more expensive) pencils do. If you buy an Urban Decay Grind House sharpener, however, you should be all set. This pencil also tends to run out fairly quickly despite its standard 0.04 oz weight. Since I use mine every day, I usually go through a pencil every two months—which at $18 a pop, can add up pretty quickly. The creamy formula makes it easy to over apply, so just be careful when you’re putting it on. For those who think the cons outweigh the pros for the 24/7 Glide-On Eye Pencil, there are many alternatives on the market. Of the ones that I have used, Christian Dior’s Dior Eyeliner Pencil is a favorite, as well as Chanel’s Le Crayon Yeux. Both are more expensive than Urban Decay and have a smaller color selection, but do come with sharpeners. Urban Decay also has liquid eyeliner options, although at the time of writing it appears that they have discontinued that product line. It might be worth checking at Amazon or Sephora to see if you can pick up the last of the stock. I personally love Urban Decay’s 24/7 Glide-On Eye Pencil, especially in Zero (black) and Oil Slick (black with glitter). Its creamy formula feels great, it lasts forever, and its colors can’t be beat. For less than $20 per pencil, it is a worthy investment for work and play.